These web pages provide a general overview of the standards, specifications and test methods used in the window, door and skylight industry relating to glass and glazing systems. 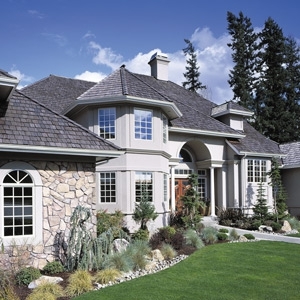 This joint effort between AAMA and the Insulating Glass Manufacturers Alliance (IGMA) is intended to explain in consumer language what each of the standards means in order for consumers to be able to discern if there are allowable characteristics within the glass in their windows, doors or skylights. Also included are Frequently Asked Questions from homeowners and guidelines for evaluating potential issues. Disclaimer: This overview is to be used for general reference only. No guarantee is made, and no liability is assumed with regard to the use, accuracy or completeness of the information contained in this reference guide. The requirements and characteristics represented here and through the referenced documents are industry references and do not represent the allowances or tolerances of individual glass, glazing, window, door or skylight manufacturers. In all cases, consult the product manufacturer for information and criteria pertaining to specific products and systems. Glass is used to provide light and allow a view from either side to the other side. It can be clear, coated, tinted and insulating. Several types of glass may be used in windows, doors and skylights throughout North America. Standards concerning the manufacture of basic glass are covered in other documents. Below are definitions for common glass types. “Annealed glass” is basic glass manufactured using the standard float glass process. All glass made for windows, doors and skylights in North America is manufactured by the annealed process. This is also known as annealed glass unless it is subsequently heat treated. “Heat-treated glass” is glass that has been pre-stressed by heating followed by sudden cooling to give it two to four times the strength of ordinary annealed glass. There are two main types of heat-treated glass: heat- strengthened and tempered glass. Tempered glass is also known as toughened glass. When it breaks, it breaks into small pieces. Tempered glass may be used as a safety glazing product; however, heat-strengthened or annealed glass may not be used as a safety glazing product without laminating. “Laminated glass” is an assembly consisting of two or more layers of one of the above glass types with an interlayer material bonded between. In many cases, laminated glass may be used as a safety glazing product, provided it meets applicable requirements. Laminated safety glass will have an etch or mark similar to that shown below, indicating compliance to ANSI Z97.1. “Wired glass” is glass that includes an embedded wire mesh. It is primarily used in fire-rated products and is not to be used as a safety glazing product. Its use has diminished greatly in residential buildings, and it is not recommended for use in areas where the potential exists for human impact. An insulating glass unit or IGU is two or more panes of glass spaced apart and sealed to form a single assembly with an air- or gas-filled (such as argon) cavity between panes. IGUs are manufactured with a variety of glass types and thicknesses. Heat strengthened, tempered or laminated glass may also be used as part of the construction. Most IGUs are manufactured with the same thickness of glass used on all panes, but other product types and special applications such as sound control, overhead glass or security may necessitate the panes being of different types and/or thicknesses. For ease of description, the surfaces of a double pane IGU are numbered according to the following convention: surface 1 (surface facing outside), surface 2 (inside surface of outside pane), surface 3 (outside surface of inside pane) and surface 4 (room side surface). Applying the same numbering sequence to a triple pane IGU results in surfaces 1 through 6, a four-pane IGU results in surfaces 1 through 8. 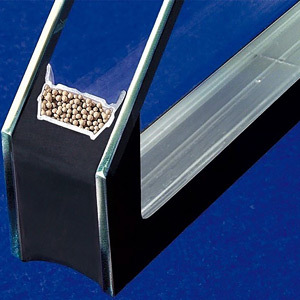 Glass panes in an IGU are separated by a "spacer" that maintains the gap between the panes. Historically, spacers have typically been made of aluminum. To reduce heat transfer through the edge of the IGU and increase overall thermal performance and condensation resistance, a spacer constructed of materials that are less thermally conductive may be beneficial. 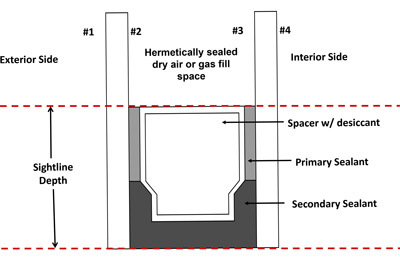 Typically, spacers contain desiccant to remove moisture within the IGU cavity. Desiccants lower the moisture dew point within the cavity, which reduces the potential for the formation of condensation inside the IGU. While clear glass is the most common glass component of IGUs, tinted glass may be used to reduce glare, reduce solar heat gain or as an architectural feature. The most common tints used are bronze, gray and green. The degree of tint depends on both the composition and thickness of the glass pane. Tinted glass is usually placed on the outboard pane of the IGU. It may require heat treatment to reduce potential stress and breakage due to absorbed heat. Glass performance can be altered through the use of films applied to one or more surfaces of glass or the IGU. Films that are applied after the glass is installed (“aftermarket” products) are typically made of polyester and, in some cases, may give the glass a reflective appearance or a one-way mirror effect. These films may be intended to reduce fading of fabrics on furniture, improve sound insulation, improve glare control or, in some instances, improve safety in case of glass breakage. However, there are usually unknown or unintended side effects that can reduce the product’s performance in other ways, shorten its useful life and negatively affect appearance. Aftermarket applied film standards do not exist at this time and use of these films may void warranties provided by the window, door, skylight or IGU manufacturer. Before applying such films, homeowners are advised to read the care and maintenance instructions along with the warranty of the film and the window, door, skylight or IGU manufacturer. Another use of films or coatings in IGU technologies is Low-E glass. There are two types of Low-E coatings available: “hard coat” or pyrolytic and “soft coat” or sputtered. Low-E glass has one or more metal coatings applied to the glass, used to reflect thermal radiation or inhibit its transmission thus reducing heat transfer through the glass. There are many different Low-E coatings, each one tuned to allow for certain spectrums of light and energy to pass through them thus providing different thermal performances to meet the needs of different climates. An alternative IGU construction incorporates Low-E plastic films that are suspended within the IGU. Instead of internal glass panes, these films are suspended through attachment to the spacer system. They offer the opportunity to incorporate high-performance Low-E coatings without the additional weight and overall thickness typical of traditional triple pane or four pane IGUs. Visual irregularities may occur if the plastic film becomes wrinkled or disengaged from the spacer system. There are no industry standard specifications for this type of construction and the product manufacturer should be contacted to address any concerns.